Born and raised in Honolulu, Stephanie Shinohara has just finished her sophomore year at the University of Southern California in pursuit of a degree in Electrical Engineering. 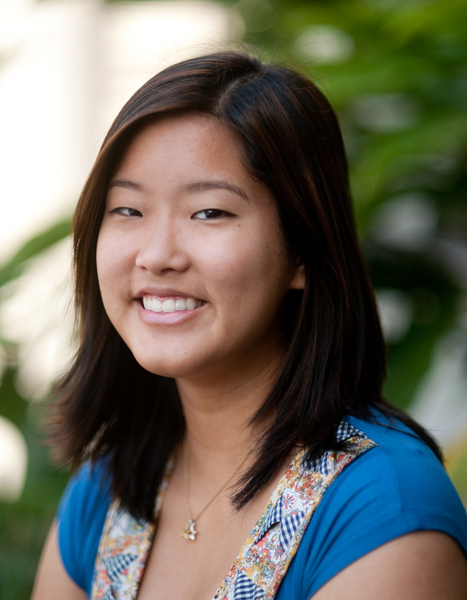 A graduate of ‘Iolani School, she has always had a passion for math and science-related classes. She enjoys attending USC football games and exploring Los Angeles (including trips to Beverly Hills and Disneyland), and she is an active member and officer of the USC Hawaii Club. Stephanie has been thoroughly looking forward to her Akamai internship this summer. The Smithsonian Astrophysical Observatory’s Submillimeter Array (SMA) currently uses a cooling system for their antennas called the “air handler.” Each handler is responsible for keeping its antenna cabin temperature constant to within a few hundredths of a degree centigrade in order for the antenna’s electronics to function properly. Last summer, another Akamai intern, Kyle Loo, designed and fabricated a test replica (simulator) of an air handler in order for SMA staff to be able to test and debug the units in Hilo, rather than traveling up to the summit of Mauna Kea every time. My project was (1) to take Kyle’s design and improve upon it by adding key components that he did not have time to incorporate, (2) improve the overall efficiency of the design, and (3) use the simulator to test a device that will help determine if a filter needs to be replaced. In order to make the simulator more efficient, I rearranged the motors and several of the wires so that they no longer obstructed access to key components and so that opening and closing the hatch was an easier process. I then installed the differential pressure sensor, pressure switch, and a weighted vent, three key components that the actual air handlers have but the earlier simulator did not. The differential pressure sensor measures the difference in pressure on either side of the handler’s filters. The pressure switch detects the change in pressure when the hatch is opened and automatically turns off the handler’s heater. The weighted vent allows air to escape from the handler when the air pressure is too high due to the recirculating air damper being 100% closed. With my test data showing the difference in pressure at various levels of filter blockage, the SMA will be able to use the differential pressure sensor on each antenna air handler in the future to determine if their filters are too dirty and need to be replaced.